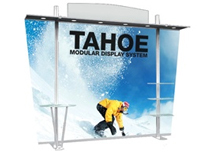 The Tahoe display is the most affordable custom modular display system. The quality aluminum frame and colorful dye sub graphic will make you stand out at any show. Every kit includes a shipping case with wheels which makes shipping and storing much easier. We also offer many accessory options including counters, lights, and monitor mounts. 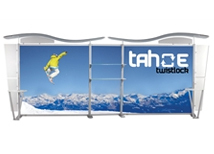 We offer the Tahoe in 10 foot, 13 foot, and 20 foot models to fit any booth space! We also offer a similar model that's called the Satellite display that offers a few other options. Check out our full line of pop up displays that are lightweight and easy to assemble! Tahoe 10 Foot Kit 1 - Includes Graphics! Tahoe 10 Foot Kit 2 - Includes Graphics! Tahoe 13 Foot Kit 3 - Includes Graphics! Tahoe 20 Foot Kit 4 - Includes Graphics! 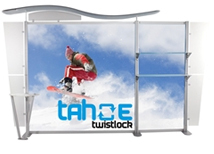 Tahoe displays hit the US trade show booth market about 6 months ago and have been very popular since that time. They quality of the Tahoe is similar to many other hybrid displays at fraction of the cost. The Tahoe is Made in China for maximum cost savings. Every kit comes with dye sub fabric graphics that are very easy to transport and while remaining very durable. The Tahoe display is more difficult to assemble than our standard pop up displays, but can still be assemble in about an hour. There are many options available for this modular display system including monitor mounts, counters, and lighting. 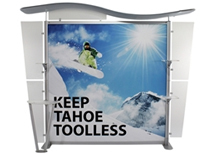 We also have a great selection of hanging banners that work great with the Tahoe display!